I recently read an article on Facebook but talked about lateness and how being late was essentially rude and disrespectful. As unpopular as it to say, I have to agree with the author's point. Lateness also just happens to be one of those things that really bothers me...more so in my professional life than in my personal life. One of my very best friends has what I call chronic late syndrome and it doesn't bother me as much with her, for example, as it does at work when people are late. The factor that sets apart work lateness from life lateness is obviously the fact that you are getting paid to be late, which is unacceptable to me. I'm often astounded that people can saunter into meetings up to 10 minutes late sometimes while everyone else is waiting on them. 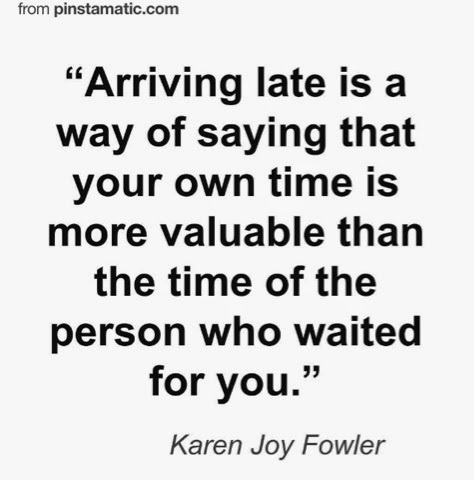 Even if people aren't waiting on that particular person, coming in late is a distraction. If you have a meeting at 11 AM and you walk in at 11 AM you're late, to me. But even walking in at the exact time is not nearly as rude as walking in at 11:03 AM. Here's a meaningful quote from the article which I will link to afterwards, "Me? Am I ever late? Sure, sometimes. That’s inevitable even with the best intentions. But I never plan to be late. I never ‘let time slide’ because my stuff is more important than yours. I am not talking about the odd occasion of lateness. I am talking about people who are routinely late. In fact, never on time. You know who I am talking about!" I may be sharing another unpopular opinion but I'm interested to hear what people think about this and if lateness is still something that's considered rude in our day and time. Perhaps my opinion is more old-fashioned than forward thinking? Wait, you think this opinion is unpopular? I think the late people are rude opinion is pretty popular. I definitely think it's rude to be late. I....on occasion have been known to be late, but it's because I underestimate the uncertainty of traffic, etc. Also, getting out of the house/office takes me so much time(gathering stuff), that by the time I get in the car...I know I'm going to be late. I prefer not to be late in "real" life or work, but I'm often late to arrive in my office but seldom late to meetings. It is especially rude when someone seems to plan to be late to meetings so as to demonstrate his or her "importance." That type of behavior is beyond rude!